I love jigsaw puzzles and crochet puzzle balls are fabulous! Dedri Uys has designed a lot of them (she’s a pro with these designs!). Today’s FREE crochet pattern is one of Dedri’s patterns that is available on her website. It’s her Amish Crochet Flower Puzzle Ball. You can find this FREE pattern here. 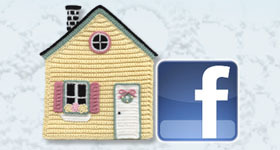 The pattern includes a LOT of step-by-step photos. 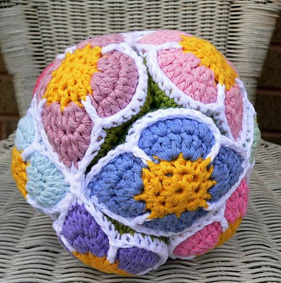 This puzzle ball is made with DK weight yarn and a size G (4 mm) crochet hook. Dedri also has an Amamani Puzzle Balls book that is published by Annie’s. These other puzzle balls are made in the shape of animals! They’re adorable!!! You can read all about Dedri’s Amamani Puzzle Balls book in the book review I wrote in my blog post last September here. I hope you enjoy this FREE crochet pattern and have lots of fun crocheting this flower puzzle ball!